1. Have them get to sleep early with a schedule and stick to it. Having their parents as a role model helps, so go to bed as early as possible yourself inshaAllah. 2. Try to avoid sweets and if you do give them sweets, limit them to between dhuhr and maghrib inshaAllah. 3. Give them a gift of an alarm clock with an athan. If you do not have an islamic shop near you, you can find them on your next trip, online, or if you have in laws in foreign countries, have them send you a couple inshaAllah. 4. Give your son/daughter the responsiblility to wake everyone up and make athaan and set out the sajada inshaAllah. 5. Make them aware that fajr comes with a privilage. If they dont pray fajr, they dont go out in the evening. 6. Although this may sound like a good idea, do not ‘reward’ them for fajr, because they may quit waking up once they tire of the reward. 7. For your children who are of age to pray, make sure they have friends who pray. You can start by widening your circle of friends to those whos own sons and daughters are practicing inshaAllah. 8. Allow your son or daughter to participate in islamic camps, as prayer is mandatory there and inforced and helps them get into the habit of waking up. 9. Establish a fajr wakeup calling system for your sons and daughters. You wake them up, they call their friends who then call their other friends until everyone is awake for fajr inshaAllah. Let them meet in the mosque if possible to pray or even take turns at each others homes for Jamaah prayer. (…a big thankyou goes out to Br.Abdallah Idris Ali from ISNA, for writing this informative paper). A juz’ Arabic: جزء‎, plural اجزاء ajza’ ) literally means “part.” It is one of thirty parts of roughly equal length into which the Qur’an is sometimes divided. This division facilitates recitation of the Qur’an in a month, especially during Ramadan when the entire Qur’an is recited in the Tarawih salat; reciting approximately one juz’ a night. A juz’ is further divided into two ahzab (groups), and each hizb (group) is in turn subdivided into four quarters. The most commonly referred and memorized juz’ is “juz’ Amma‘,” which is the 30th juz’ and contains Surahs 78 through 114, most of the shortest suras in the Qur’an; these are the suras typically read during regular prayer, and ‘Amma is generally taught first to our sons/daughters. Asalaam alaikum ramahtullah wa barakatu. I will start of by saying that women in islam are very well respected for their jobs not only outside the home, but for all the work we do taking care of our families – our sons, daughters, husbands, mothers, fathers and in-laws alhamdulillah. Although we want to do more during ramadhan, we sometimes cannot make it out of the house for taraweeh prayers. What do we do then? We pray at home insha’Allah. Taraweeh prayer is a confirmed sunnah with twenty rakahs. It is prayed in sets of two rakahs. Any Quranic recitation you know by heart can be recited during taraweeh insha’Allah. After every four rakah, you should rest and make dhikr. dhikr of the spirit, which consists of utter submission and acceptance (taslim wa rida’). Insha’Allah I hope this is beneficial to you all and Allah reward you for all your intentions this coming ramadhan, ameen. 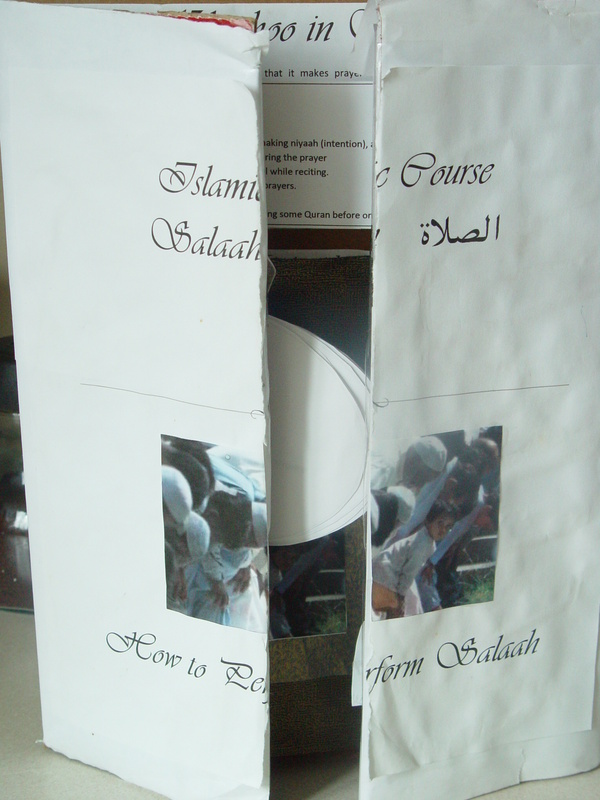 Alhamdulillah this was our first lapbook and project for his islamic studies, it is a salaah book. 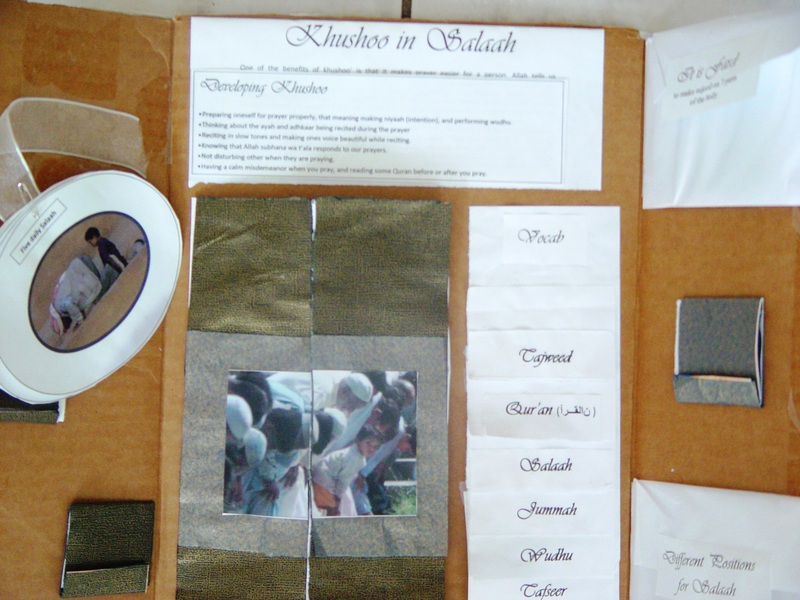 Inside we made vocabulary pages – quran, tajweed, salaah, etc – and a pocket with the cut out words and photos of the places of the body that it is fard to pray on , ie.. the forehead, hands, knees, etc. We also have an oval flipbook of the five prayers, their names, and when we pray them, and the steps to prayer. There is also information on khushoo in salaah, etc. It came out well alhamdulillah.